The creation of a personal healing shield is a defining experience for many students in the Social Service Worker program at First Nations Technical Institute (FNTI). Mary Ann Spencer, an SSW instructor, introduces the concept of healing shields as part of the second-year curriculum and helps students create their own shields. "The process of creating shield helps students to actualize the gifts they bring to the development of their Indigenous-based healing practice,” says Spencer. "The idea of the shield is one of protection for those they will help as social workers. It represents how they will treat those they help with love and respect, non judgement and unconditional acceptance,” she explains. Students are encouraged to use meditation to help discover their own unique abilities and strengths. It can also help identify challenges that each person is facing on their path. 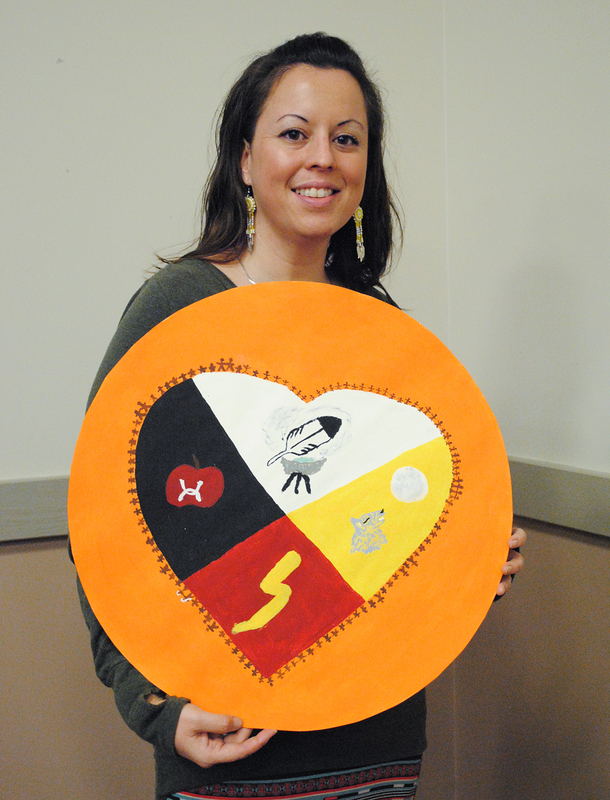 The making of healing shields is just one way in which Indigenous culture, knowledge and wisdom are incorporated into the social service worker course curriculum. The two-year program is delivered by FNTI in partnership with St. Lawrence College. Students graduate with at Social Service Worker Diploma from St. Lawrence College. “The program teaches us that we need to heal ourselves before we can begin to help others . . . I believe that the whole program is designed to help us heal,” Lucas explains. Below is Danielle's description of her shield. Representative of my gift, the ability to have love for anyone. Represent the ancestors and knowing that I am never alone, all of the people that I will work with and those of the next seven generations that we are preparing for. To me it also says that I am willing to try and walk with anyone who would like me there on their journey. There are two figures with white hair who represent my ancestors who were there to greet me with my gift during our guided meditation. I try to be all of these with everyone. I love to make people smile and help them to feel at ease. Receiving a smile can change a person’s whole day. I have the ability to remain calm in most situations. I can approach/speak gently with people which helps them to be at ease and more easily share their stories. Rather than saying why, I believe more in why not! I know who I am now and what I stand for, with that clarity about myself, I feel I am able to now help others find their way. With the love that I hold for everyone I know when I work with people that are able to feel that love and acceptance. I will be a child at heart forever, I love to play and be silly. I am a fierce protector of my family and my people. I am unafraid to advocate for those who are unable to for themselves. A reminder that I will work in a way that promotes self-care so that I remain a strong wholistic helper. It reminds me that I am good medicine for my people as a Social Worker and Life Coach, I offer something from each section of the medicine wheel model. I have educated myself and will continue to be the strongest helper I can be. I have a strong spiritual connection and am open to sharing my teachings with all of those who seeking personal growth. The Wolf – I am independent, strong and protective. I will be picking up the pieces when I work with my people much like the wolf does in the woods. Full Moon – I am very aligned and sensitive to the moon cycles. My energies are heavily affected by this cycle. Lightning Bolt: Represents my high energy, powerful love and the fact that I am incredibly passionate about working with my people. The Apple- As a wholistic nutritionist, I believe in clean eating as an important part of everyone’s lives. The Under Armour Symbol- As I am well known for sporting this brand, I used this to represent having an active lifestyle. As a children’s fitness coach, Zumba instructor and former personal trainer, I know that being physically fit is a crucial part in wellbeing. The Eagle Feather, Smudge Bowl & Medicine- I love working with and believe greatly in my medicines, be it music, nature, or plant medicine. I believe they all hold great power to help me clear my mind, be reflective and work through my thoughts.